Over the next several days, I’d like to introduce you to several tools I use including the Zen To Done system, Problogger’s 31DBB and Copywriting Handbook for Bloggers. Today I want to focus on an organization tool. In addition to owning and running The Small Business Transcriptionist and offering coaching services at Simple Virtual Team Success, I have a 3 year old daughter and I’m a full time online college student. Now let me tell you my secret to getting stuff done and still being able to leave to house to go to hockey games. Mindmaps. As you may have noticed across my site here, here and here, I love my business and the ladies that work for me. School is a little bit duller for me. I don’t like being on someone else’s time line and told what to do. Some of my classes are slow for me because I’ve already worked in HR for several years. I hate to admit it but I got in a bad habit of turning in late assignments. This semester I’m almost a month into classes and I’ve noticed recently that I’m not as stressed about my classes as I have been before. I had Anita Johnson do the dirty work for me and add all my assignments and due dates to not only my Google Calendar but to a mindmap. The calendar reminds me things are due but it’s not a proactive help for me. Here’s how I make Freemind take the strain off my brain. Say I know I have a technical document analysis due on September 13th. Instead of just looking at me on my calendar, on my Mindmap I can make a note of the article and URL I plan to use and make notes on my key points. If I look farther forward towards final projects, I can like options and ideas and outline my papers- All on the same mindmap. Now hot stuff, I can LINK this mindmap to my Projects mindmap I use for my business and see what order I need to get my tasks done… Not just this week but for the next 4 months. 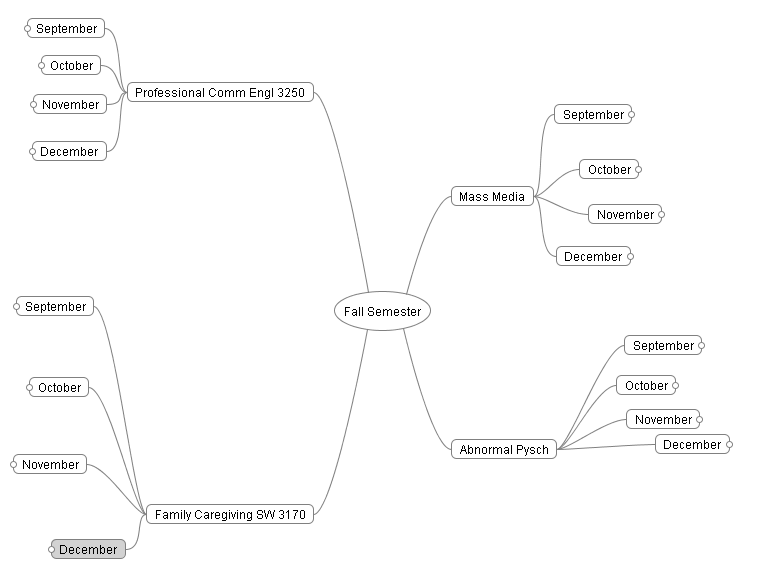 So you see how it use Mindmaps to organize my classes. Here is a big shot of my Projects Mindmap. You can see the little circles are collapsed “legs” and the red arrow is a link to my Classes mindmap. When I want to focus on a project such as my VTS project at the top right, I collapse all the other legs of my mindmap where visually and mentally I am focused on that one “pod” of tasks. This also helps me get all my ideas and todo tasks out of my mind and onto the page. I use Freemind on my laptop and bMind on my Blackberry. I have a very dissociative mind and my process used to be to write everything out on a piece of paper, order it correctly, rewrite it and then redo it the next day when my priorities were different. I had sheets of paper everywhere. About 18 months ago, I was introduced to mindmaps and Freemind by Bob “the Teacher” Jenkins. ely tell me where to start. I struggled with this concept others seemed to love and heavily rely on. In comes Bob’s Discover Freemind. Discover Freemind worked for me because Bob detailed first what I could do with mindmaps and then showed in the thorough videos how to do each step. The videos showed me features in Freemind I never would have thought to look for but make my mindmaps work a thousand times more effectively. Freemind is free to download. You can get Discover Freemind two ways. You can go to Discover Freemind’s site OR you can sign up for Bob’s IM Success Library. I highly suggest the IM Success Library because you get access to all of Bob’s “lessons” including CPanel, Autoresponders, and my favorite- Teleseminar formula. There’s so much included in the monthly subscription, you really need to pop over there and take a look . I’m so confident in Bob’s teaching and coaching skills, I am in his private mastermind coaching program. Bob is also having an event this week, SIMPLE. I was fortunate to be at the first SIMPLE but due to some childcare issues I can’t come this week. Sad day but I will be at the event in March. I hope this gives you some ideas and a starting point to start using mindmaps to focus your business. Love Bob’s mind map info. I had not been understanding it AT ALL and at NAMS he taught a class on it and I went in saying I was going to get it before I left Atlanta LOL And he wouldn’t let me leave until I got it and now I’m hooked. I am now making mind maps for everything, business (blog posts, site ideas, product reviews, etc. ), keep track of my workouts and more. Love it!